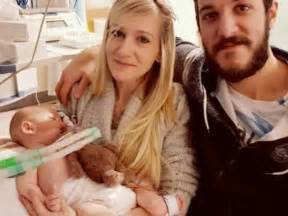 It is a sad and heart-wrenching day for Charlie Gard, his parents, and humanity. If you've been following my blog for the last few weeks, you know that I've been following Charlie's fight for the chance to live (here and here). When he was born eleven months ago, we was diagnosed with a rare mitochondrial disease that left him unable to move or breathe on his own. In the last couple months, the hospital treating him in the United Kingdom decided to cut life-support because there was nothing they could do, but the parents wanted to transport him to the United States for an experimental treatment. The saga played out in the United Kingdom court system with the judge agreeing with the doctors. Several foreign doctors and hospitals offered to transport and treat Charlie free of cost, but the request was denied by the court. After an international outcry, the judge finally ordered an MRI scan on Charlie to determine the feasibility of success with the experimental treatment. The US doctor evaluating the scan announced yesterday that the "window of opportunity" for a greater than 10% chance of success had been missed. This caused Charlie's parents to lose all hope and finally give up their fight for their son's life, and they will be spending his last days with at his bedside. I cannot help but see that the reason the window of opportunity was missed is because the doctors and judge were so bent on seeing Charlie's death that they intentionally stalled any and all treatment and tests. This window could have been discovered and action taken within it had the doctors not resisted the choice of the parents with the power of the government behind them. The doctors at that hospital could have avoided the whole moral and legal battle and emotional pain of the parents (and the world) had they allowed their international peers to do what they solemnly sore to do (protect the life of their patients- see the Hyppocratic Oath). In that refusal, these doctors violated the Hyppocratic Oath, themselves. But they have not only violated an oath to the medical community and to the public, but they have violated the Image of God. In refusing to recognize the intrinsic worth of their patient, they saw him as expendable and not worth the cost of the resources it would require to save him. This is the result of such a denial. In a medical world that is devoid of the understanding of intrinsic human worth, every patient will enter a facility with a dead line and a price tag; if either are exceeded, the project (patient) will be scrapped. As Americans, who enjoy freedom based upon our intrinsic worth "endowed by our Creator," we must do all that we can to prevent such a medical world from crossing the Atlantic. As Christians, we need to be there for Charlie's parents to support them in every way we possibly can for the rest of their lives. This is a wound that will not heal with time. This is an evil that cuts to the very heart of what it means to be human. Charlie's parents know this, and they have sworn that they will do all that they can to prevent other parents from having to experience such horrendous pain at the hands of those who are supposed to protect them (physicians and the government). As the Church, we need to support them. We need to see that Charlie and his parents have not suffered needlessly at the hands of evil men. We need to protect the Image of God; we need to defend life. What men intended for evil, God intended for good (Genesis 50:20). We are created in God's Image, so we can do the same. Let us choose to turn this evil on its head, and show the world the love and hope of Christ and the reasons we have them (1 Peter 3:15), so that this finite suffering cannot compare to the infinite glory that will be revealed through eternal life (Romans 8:18). This particular battle for a life may have been lost, but the war for eternal life through Jesus Christ will be won.